Japanese troops salute fallen comrades at Pyongyang, Korea during the First Sino-Japanese War (1894–1895). The Battle of Pyongyang was the second major land battle of the war and took place on September 15, 1894 (Meiji 27). 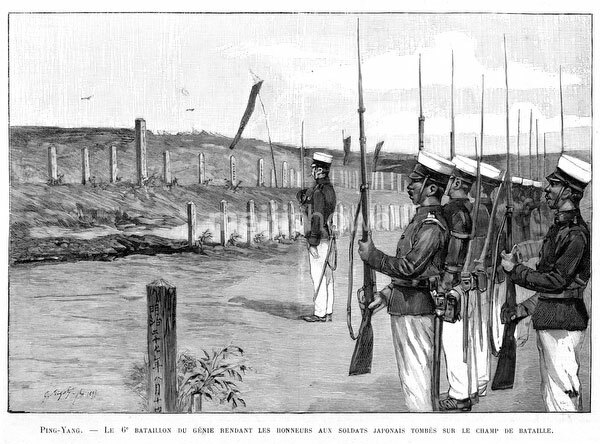 Published in the French illustrated weekly Le Monde illustré on December 15, 1894 (Meiji 27). Art by French artist Georges Ferdinand Bigot (1860-1927), famous for his satirical cartoons of life in Meiji period Japan.